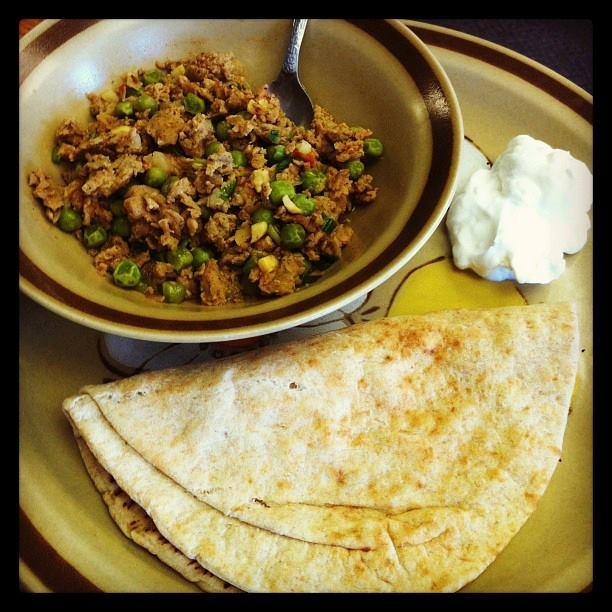 Muttar Chicken Keema (Spicy Ground Meat with Peas) Is a very famous dish usually made with ground beef. Served with Naan and yogurt. This has a healthier kick to it! Please view the ingredients in the Recipe Directions since I could not find some of the spices. Start by adding all the seasonings minus the cumin seeds in a bowl with the Greek Yogurt. Then add the seasoned yogurt to the raw chicken marinate for minimum 30 mins. While the chicken marinated you can start on the Masala. In a large hot wok spray some pam spray and add the cumin seeds. Toast the cumin seeds for 1 min then add garlic. Since there is not much oil in the wok you need to make sure you donâ€™t burn the garlic, once the garlic is golden color add the onions and cover the lid. Keep stirring every 2 mins till the onions are translucent. Make sure the stove is still on med high, and then add minced ginger and keep stirring not allowing the masala to burn after 2 mins add the tomatoes and cover the lid again for 5-8 mins stirring every 2 mins. Most masalas you will see oil separation but since we only used pam spray you wonâ€™t see that but you will see everything is come together like a thick salsa kind of that is when you will add the ground chicken. Make sure you mix the chicken well with the masala, cook for 4 mins per side and flip over. Once both side are browned then you can break up the ground chicken. Add Â½ cup of water and let it shimmer on medium heat for 10 mins. Deposit the frozen peas with warm water and add to the chicken keema cook for another 5 mins, garnish with green onions or fresh cilantro. Makes 8 servings.